This was published Wall Street Journal Think Tank column on September 18, 2016. While the political world focuses on the Affordable Care Act, changes have been occurring for the many more Americans who get health insurance through work. The biggest change: rising deductibles, which are transforming the nature of health insurance from more comprehensive coverage to skimpier insurance with higher out-of-pocket costs. This change has happened gradually and has not been the subject of a big legislative debate, as the Affordable Care Act was. The shift is not a result of Obamacare; the trend began well before the ACA was passed in 2010. The trend is not highly politicized or covered daily by the general news media. All of which contribute to making the changing nature of insurance the most important development in the U.S. health system the public is not debating. For 18 years, the Kaiser Family Foundation and the Health Research and Educational Trust have done an annual survey of employer health benefits. This year it found that deductibles rose 12% in 2016 in the group market and four times faster than premiums increased. For context, 150 million Americans get coverage through their employers. The trend toward higher deductibles is especially pronounced among employers with fewer than 200 workers, where 65% of employees are now in high-deductible plans. The average deductible in these firms is $2,000. Rising deductibles, coupled with the slow economic recovery from the Great Recession, has depressed utilization of health services and helped to keep premium increases lower than they would otherwise be. High-deductible plans are cheaper: Family coverage in a typical high-deductible plan with a savings option runs $16,737, compared with $19,003 for a PPO plan for a family. Enrollment in high-deductible plans with savings accounts reduced the average premium increase for all employers by half a percentage point in 2014 and 2015. But just as high deductibles help hold down costs, they also can take a big bite from the pocketbooks of consumers. 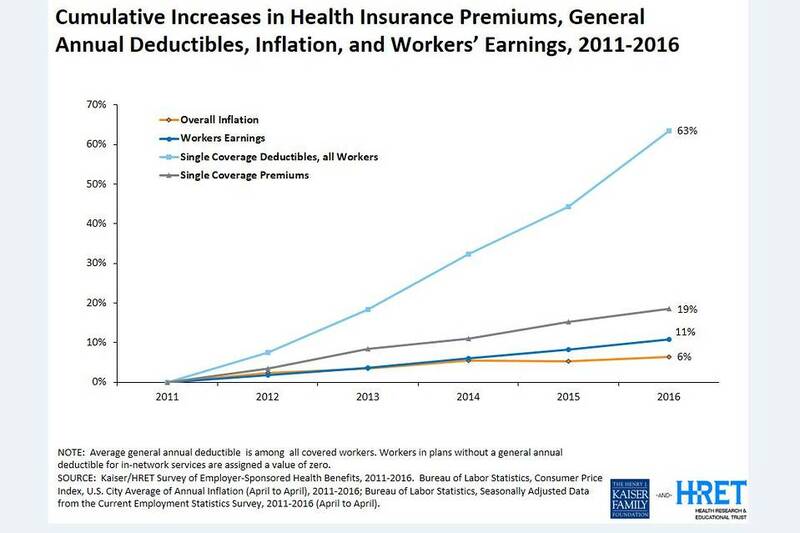 As the chart below illustrates, deductibles are rising almost six times faster than wages. This, more than any other single factor, is why consumers don’t see the bright side of the historic moderation in health costs the country is experiencing. Their share of premium payments is up–if more modestly than in the past–and their deductibles are growing steadily and in some cases steeply, while wage growth has been sluggish. High-deductible plans with tax-preferred savings accounts are not for everyone. In general, they can be a good option for people who are in relatively good health, but they can expose people who have more modest incomes and chronic health needs to out-of-pocket costs that can be a barrier to care and a threat to their economic security. People with high deductibles are vulnerable to sharp increases in drug prices, such as those for EpiPen that have been in the news recently. Some people who have high-deductible plans with savings accounts receive employer contributions to their accounts that can offset some of their out-of-pocket costs. The ACA caps annual total out-of-pocket costs in the group as well as non-group market for most plans at $6,850 per year for individual coverage and $13,700 for family coverage, eliminating additional out-of-pocket costs for in network services. The presidential candidates diverge sharply on deductibles. Hillary Clinton has proposed a tax credit to help people with very high out-of-pocket costs pay their health-care bills. Donald Trump has supported expanding high-deductible plans with savings accounts. Early on, the next president will face choices on health care, including whether to focus on ACA fixes or on consumer pocketbook issues. The latter, such as rising deductibles and drug prices, generally resonate more strongly with the public. Whatever the new Congress does, one of, if not the most, pressing question in health care is shaping up as: How much cost-sharing is too much and for whom?